What makes a movie interesting? 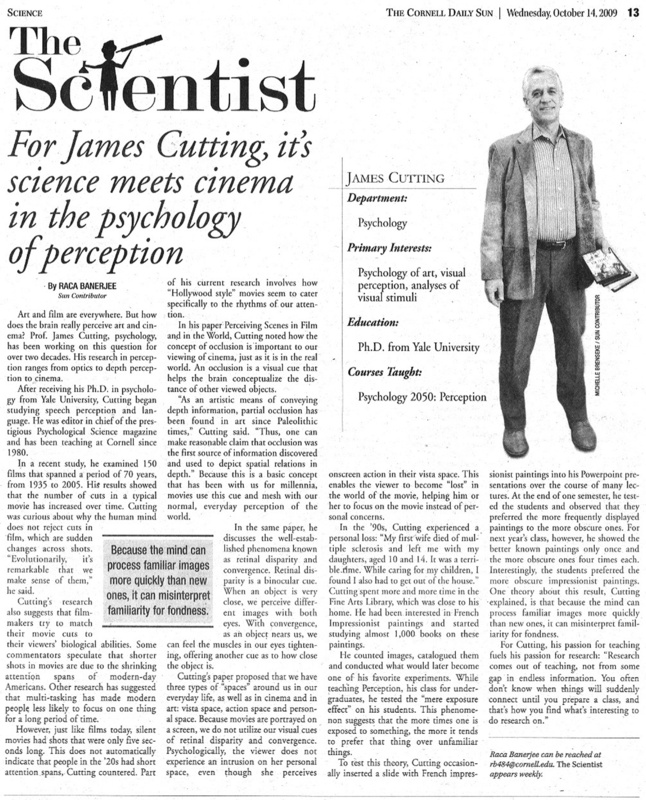 The psychology behind filmmaking, Cornell Daily Sun, 24 Feb 19. article. What we know about art and the mind. Paul Bloom. The New Yorker, 6 Sept 2018, article. Rule the World: The art and power of storytelling. Paul Furlong. Opus Media, 11 July 18. podcast. Spoliers: Letter of recommendation, Jenna Wortham. New York Times Magazine, 14 Feb 18. article. Cinemetrics Across Borders, A Neubauer Symposium, 5 Feb 2018. video. Movie expressions. Richard Hamilton. BBC news, 2 Feb 18. podcast. 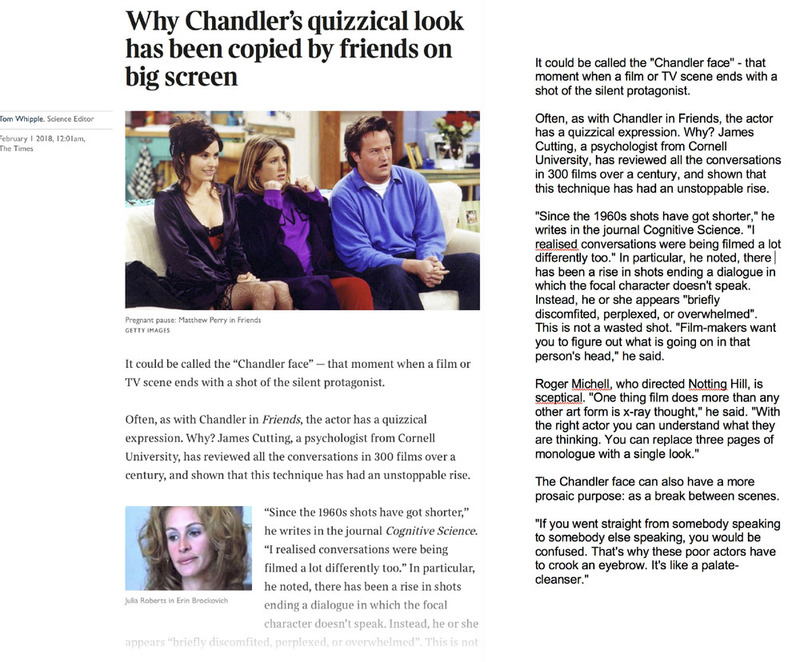 Why Chandler's quizzical look has been copied by friends on big screen. Tom Whipplie. The Times of London, 1 Feb 18. news. Wayward ways and roads not taken. Observations of film art. David Bordwell. 17 May 2017 blog. Movies in the mountain, and on the machine. 101 movies. Observations of film art. David Bordwell Blog. 2 Apr 2017 blog. Las claves que esconden los hit de la Cultura Pop Actual. Guillermo Tupper. El Mercurio-Chile, 11 Mar 2017. web feature. 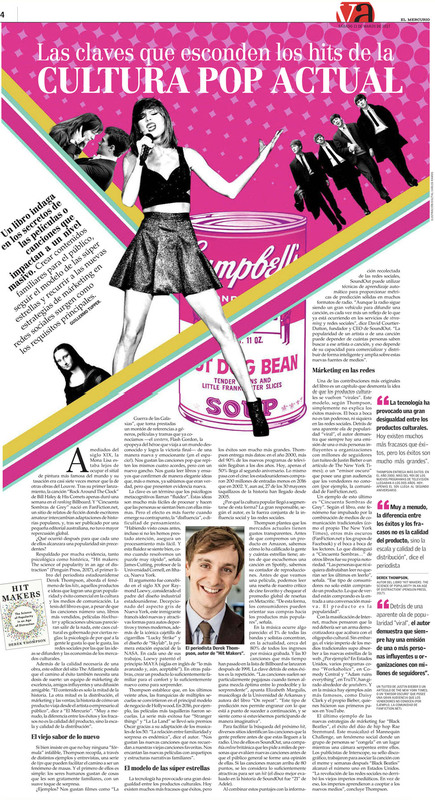 Hit Makers: The science of popularity in an age of distraction, by Derek Thompson, pp. 19-24. Feb 2017. web feature. It's okay to love movies that are so bad they're good. Dyani Sabin. Inverse. 1 Sep 2016. blog. Scale, clutter, and Facial Expressions. Sage video. 10 June 2016. video. Buidling Rosebud before you can imagine it: The architects of cinema. Thomas Vowles for the Psychonomic Society. 8 Jun 2016. blog. Going with the Rosebud: What movies are really like. Stephan Lewandowsky for the Psychonomic Society. 7 June 2016. blog. The biological basis of visual perception. Christophe Morin, Linkedin/Pulse. 23 Mar 2016, blog. Here's looking at you, kid: Filmmakers know how we read emotions, Susan Kelley, Cornell Chronicle, 25 Jan 2016 blog. Back to the Future Day: Why this 80s flick is one of Hollywood's best, James Croot, 21 Oct 2015, blog. Canon of taste, Jill Neimark, Aeon, 11 Aug 2015 blog. Strange continuity: Why don't our brains explode at movie cuts? Jeff Zacks, Aeon, Apr 2015 blog. How psychology helps canonize the 'Mona Lisa' and other artwork. Susan Perry, MinnPost, 5 Nov 2014, blog. Data froma century of cinema reveals how movies have change. Greg Miller, WIRED, 8 Sept 2014. blog. Come gli spettatori elaborano le immagini e le storie viste al cinema, Gamemag, 30 Aug 2014, blog. How movies manipulate your brain to keep you entertained, Greg Miller, WIRED, 26 Aug 2014, blog. Storytelling and the rhythm of movies, Arthur Shimamura, In the brain of the beholder, Psychology Today, 20 Aug 2014, blog. Cognitive scientists, filmmakers explore cinematic perception, George Gerba, etcentric, 27 Aug 2014. blog. Movies in your brain, Academy of Motion Picture Arts & Scieces, Linwood Dunn Theater, Hollywood, CA, July 2014, advertisement. AMPAS summary. Evolution in Hollywood editing patterns? Mike Baxter, Nov 2013, cinemetrics. blog. Salt on Baxter on Cutting, Barry Salt, cinemetrics, June 2014, cinemetrics. blog. More on the evolution of popular film, JEC, cinemetrics, June 2014. blog. Why the Mona Lisa stands out. Intelligent Life, Ian Leslie, May/June 2014. blog. Explore. Ian Leslie, 20 May 2014. blog. Could there ever be a cinema without cut? Cocktail Party Physics. Jennifer Ouellette. Scientific American, 29 Apr 2014. blog. Our need for speed, The Dish, Andrew Sullivan, 1 Feb 2014, blog. The pleasure and pain of speed, T. Vanderbilt, Nautilus, 23 Jan 2014. blog. Mere exposure to bad art. Experimental Philosophical Aesthetics. 26 Nov 2013.blog. Do we learn to love bad art? Bob Duggan. Big Think. 4 Sept 2013. blog. The utility of bad art. Behavioural Economics, The Economist. Aug 2013. blog. Bad art definitely bad, science confirms. Hyperallergic, 7 Aug 2013. blog. Nature versus nurture in artist's reputations. Art Market Monitor. 7 Aug 2013.blog. The Electric Fish, Episode 7 - Mere exposure to bad art. 1 Apr 2013: blog. Does bad art grow on you. The Dish, Andrew Sullivan, 22 July 2013, blog. Psychocinematics: Cognition at the movies: Story arcs and the rhythm of movies, 1 Mar 13. blog. How do you know if 'bad' art is really bad? OUP blog. Aaron Meskin et al, 16 July 2013. blog. Does increased exposure to a piece of art make us like it more? phys.org. 4 Mar 2013. blog. Connecting with Cornell, Vol 23(1), 2012: publicity. David Bordwell, Observations on Film Art, Cognitivists storm Big Apple! 18 June 2012: blog. Maria Konnikova, The innate irrestibility of film. Scientific American; 15 Apr 2012. blog. The utility of bad art. Free Exchange. The Economist, 7 April 2013. blog. Nick Redfern, Research into film, Robust time series analysis of ITV news bulletins; 5 Apr 2012: blog. David Bordwell, Observations on Film Art, Bringing to book; 3 Apr 2012: blog. Tim Smith, Continuity Boy; 23 Mar 2012: blog. 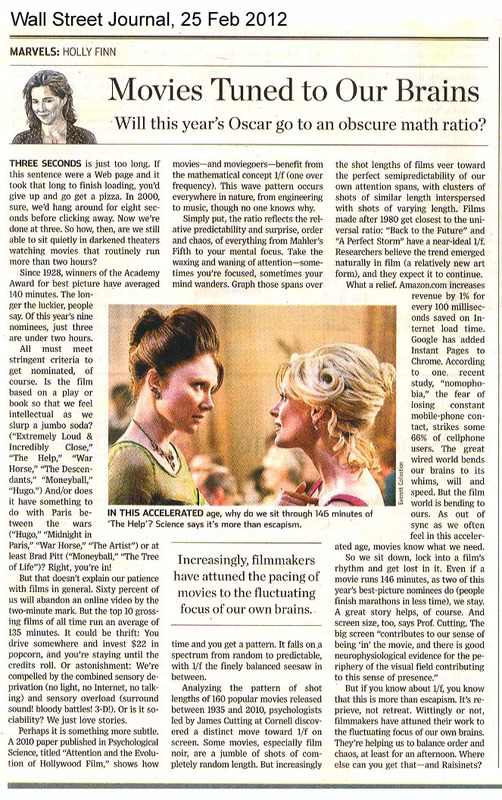 Wall Street Journal, Holly Finn; Marvels, 25 Feb 2012: news. Film Psychology, Interdisciplinary Psychology and Film Studies Research; 17 & 25 Feb 2012: blog. Robin Tooms, Patterns are key in grabbing our attention; 26 Feb 2012: blog. Nick Redfern, Research into film, Statistical illteracy in film studies; 2 Feb 2012: blog. Experimental Philosophy: Mere exposure to bad art: Experiment results, 11 Oct 2012. web feature. Mere exposure to bad art: Experimental Results. Experimental Philosophy, 24 Oct 2011. blog. University of Texas, To the beat of a different dru; 29 Aug 2011: web feature. Kristin Thompson, Observations on Film Art, Cognitive scientists 1, screenplay gurus 0; 9 Jun 2011: blog. 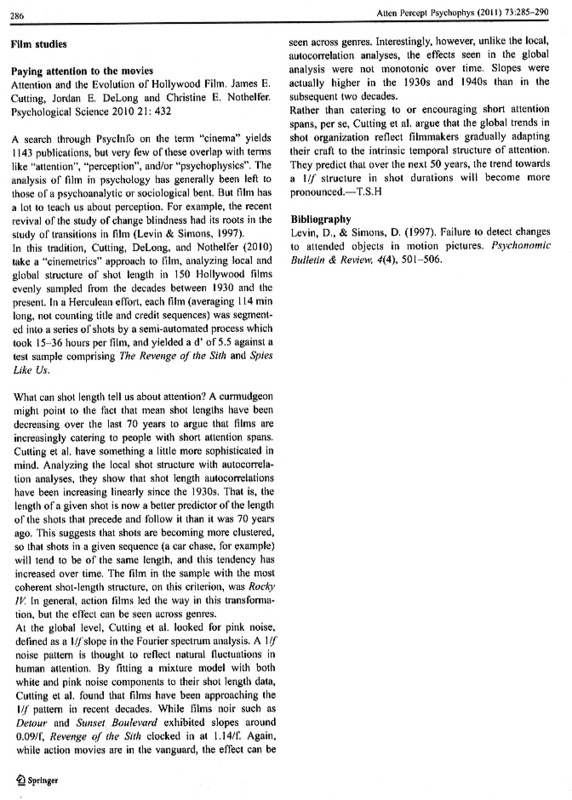 Film Studies: Attention, Perception, & Psychophysics, 2011, 73, p. 286 news from the field. Cinema Salon, WJRC Brown; 21 Jan 2011: blog. Cinéma et Cognition, Compas/CNRS; 12 Oct 2010: web feature. Cognitive Science, Rensselaer Polytechnic Institute; 22 Sept 2010: videocast. Science Cabaret, WICB; 8 August 2010: podcast. Cornell Alumni Magazine; July/August 2010: news. Cinema: Journal of Philosophy and the Moving Image; not dated: blog. On the evolution of Hollywood film. Cornell Alumni Affairs. 30 June 2010. video. Cornell Alumni Weekend, Arts and Sciences talk; 11 June 2010: videocast. Pink Noise, Wikipedia wikipedia entry. Cinema Salon, Cognitive Approaches to Film: 4 Jun 2010: blog. Society for the Cognitive Studies of the Moving Image Keynote Address, Roanoke, VA; 3 Jun 2010: videocast. 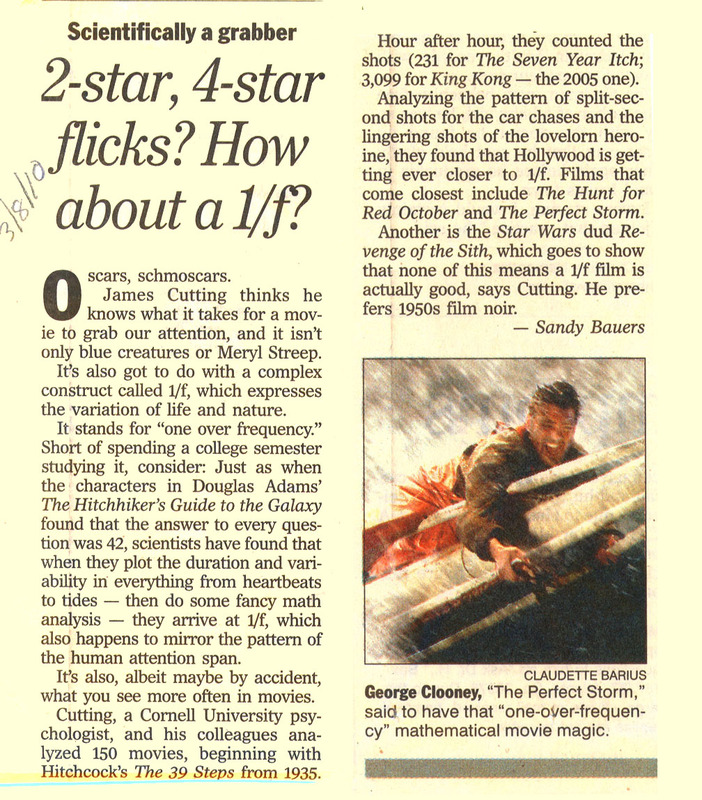 David Bordwell, Observations on Film Art, Now you see it, now you can't; 21 Jun 2010: blog. La Repubblica (Italy); 7 May 2010: news. Deutsche Welle (German Radio); 27 Apr 2010 podcast. Ithaca Action News, Lights, Camera, Attention; 23 Apr 2010: podcast. Alex Pasternak, Motherboard, Hollywood films' cut structure mimics life. Apr 2010 blog. Review in 16:9 (Danish Film Magazine); April 2010: review. Second Reply to Salt, Cinemetrics; 15 Apr 2010: blog. Barry Salt's second commentary, Cinemetrics; 4 Apr 2010: blog. Reply to Salt, Cinemetrics; 25 Mar 2010: blog. Barry Salt's first commentary, Cinemetrics; 22 Mar 2010: blog. Eliot Gelwan, Follow me here, Tag achives: film; 21 Mar 2010: blog. W radio (Colombia); 14 Mar 2010: podcast. Rob Kall Futurehealth interview; 14 Mar 2010. podcast. Cornell Chronicle; 9 Mar 2010: news. Philadelphia Inquirer; 8 Mar 2010: news. Der Spiegel (Germany); 5 Mar 2010: news. Psychology Today; 3 Mar 2010: publicity. New York Times; 1 Mar 2010: news. Vancouver Sun; 26 Feb 2010: blog. FoxNews, National Geographic; 25 Feb 2010: publicity. Justine Fields, IvyGate; 24 Feb 2010: blog. World Science, The science of Hollywood blockbusters: 23 Feb 2010 blog. Internet Movie Database; 19 Feb 2010: publicity. AOLNews; 23 Feb 2010: publicity. Association for Psychological Science, News Release; 23 Feb 2010: publicity. CBC (Toronto) "As It Happens" interview; 19 Feb 2010 (3/4s into it): podcast. Wray Herbert, APS commentary, We're Only Human; 18 Feb 2010: blog. New Scientist; 18 Feb 2010: publicity. Tim Smith, Continuity Boy; 17 Feb 2010: blog. Cornell Sun; 14 Oct 2009: news. Keith Oatley's commentary; 22 Apr 2009: blog. APS Convention, recognition as editor of Psychological Science, 24 May 2007. videocast.